But in the United States, Volkswagen sales tumbled 18% year-over-year. Volkswagen USA hasn't sold more than 35,000 vehicles in a single month since August of last year. The brand's U.S. volume has fallen in all but four of the last 24 months. VW's U.S. market share in the first-quarter of 2015 fell to 2.0% from 2.3% in the first three months of 2014. Like Volkswagen with their affordable performance car, the GTI (which, together with the Golf R, accounted for 8.3% of VW brand sales in America in Q1), Mazda is another affordable brand which caters to enthusiasts with their MX-5. Like Volkswagen, Mazda succeeds to a far greater extent in Canada than in the United States. One key difference between the pair is Mazda's recent success in the U.S. – 2014 sales rose 8% to more than 300,000 units, the brand's highest tally since 1994. But while Mazda generates 4.4% of the Canadian auto industry's volume, their U.S. market share is VW-like at just 2.0%. In fact, Mazda USA volume is flat in early 2015 because of a slower March during which sales slid 8%. Over the last decade, Mazda's U.S. market share has barely moved the needle and is no better now than it was at the beginning of the recession. Imagine then, for a moment, if Volkswagen and Mazda USA were succeeding in the U.S. to the same degree that they were proving their mastery of the Canadian market. True, things would need to change dramatically for that to happen. Volkswagen Canada credits very market-specific product planning and aggressive pricing strategies for their success. The Jetta, for example, is marketed with a base price below $15,000 in Canada, a country that's widely known for its more costly cars. As for Mazda, because the Canadian market isn't keen on midsize cars, the company is able to overcome the 6's outrageously poor performance with strong 3 sales in Canada's vastly larger compact segment. That's a more difficult task in the U.S., where most best sellers are midsize cars and the midsize category is comparatively vast. But again, let's say for the sake of more than just curiosity, that Volkswagen and Mazda earned U.S. market share like they earn Canadian market share. The numbers would be staggering. If Volkswagen claimed 4.3% of the U.S. market, their sales in the first-quarter of 2015 would have totalled 170,000 units. Rather than sitting in 15th place among auto brands – behind Kia, Subaru, Dodge, GMC, Ram, Mercedes-Benz, and the three-vehicle Chrysler brand – Volkswagen would rank eighth, right behind Hyundai. But 170,000 sales is more than double the number of sales currently being reported by VW USA. The bright side? For Mazda, a new MX-5 A NEW MX-5 won't provide a huge volume boost on its own, but it'll drum up positive attention for the Mazda brand if it's marketed properly. The upcoming CX-3 is the likely candidate for I-Can't-Believe-It-Drives-This-Well status at Mazda, and it'll perform exceedingly well in Canada, perhaps not quite so well in what will surely become Honda HR-V-loving America. As for Volkswagen, the exceedingly profitable Audi and Porsche brands are booming. Audi USA volume is up 14% in early 2015 in a market that's up just 6%; Porsche sales are up 13% to Scion-challenging figures. And yes, Volkswagen won't continue with the current product lineup forever. The Tiguan (which is selling better than ever in Canada) is ancient, the Passat quickly became unloved, and the brand desperately needs its CrossBlue-like SUV to hurry up and arrive. Meanwhile, the two cars which enthusiasts so quickly identify with at Volkswagen and Mazda, the Golf GTI and MX-5 Miata, don't actually sell much more often in the more performance-oriented U.S. market. 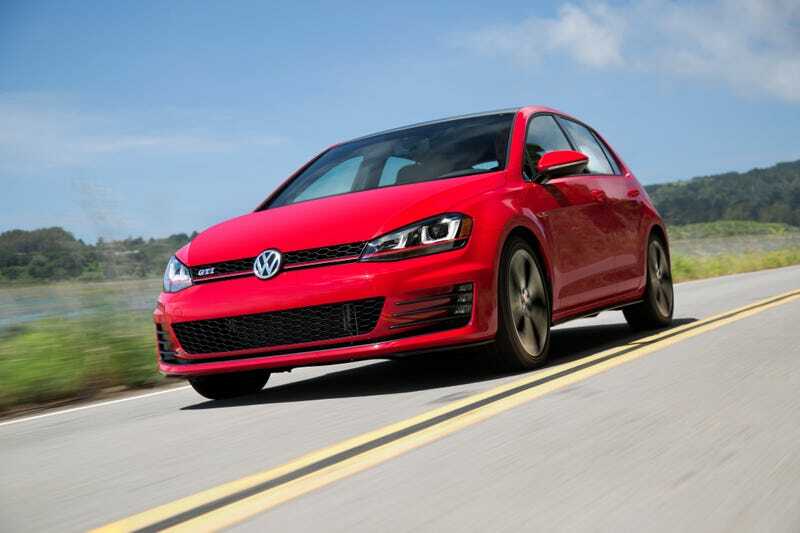 Over the first three months of 2015, GTI sales are only nine times stronger in the U.S. than in Canada, although the auto market was 11 times larger in the U.S. during that period. And over the last 39 months, MX-5 sales in the U.S. are only ten times greater than they were in Canada, a poor result considering the significantly more fervent convertible desires south of the border.